I picked up my onion sets today. Unit cost was $1.388 per lb. for bulk sets, around $70 per 50 lb. bag. Total cost was $416. 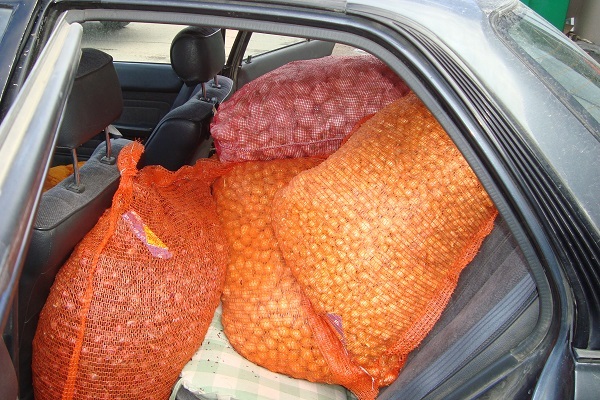 Not the type of cash you want to lay out this time of the year, but if you want to make money, you have to spend some, and onions are a guaranteed moneymaker. Sets are worth the cost because they give you a jump on production and get some cash flowing early in the season. . I use several different cropping strategies, planting over the next few months for scallion, green onion, and mature. Onions are one of those crops that produces a steady return on investment throughout the entire season. They contribute at least $10k to my total revenue target. Over the season those $10k’s add up.. Growing onions from sets is a good approach for early season production and for growers with short seasons. 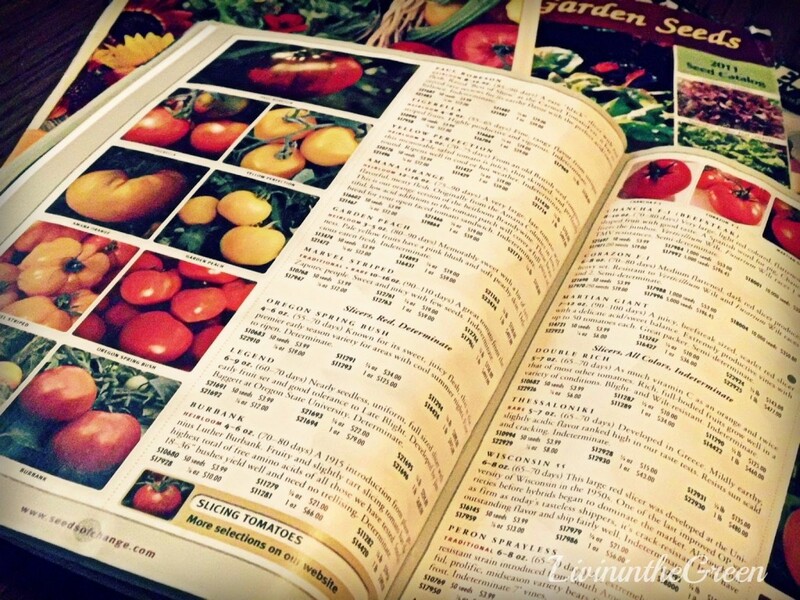 Seed Saving ROI – Would You Believe $250K? Seed saving has been in vogue for some time now, and there are lots of good reasons to do it. Here’s one that surprised me. In crunching some numbers on garlic production, I figured out that from a $500 investment in seed garlic this year, I can grow this investment by 5 times, each year, so at the end of year 4, I’ve turned 250 heads into 125,000 heads worth $250k. 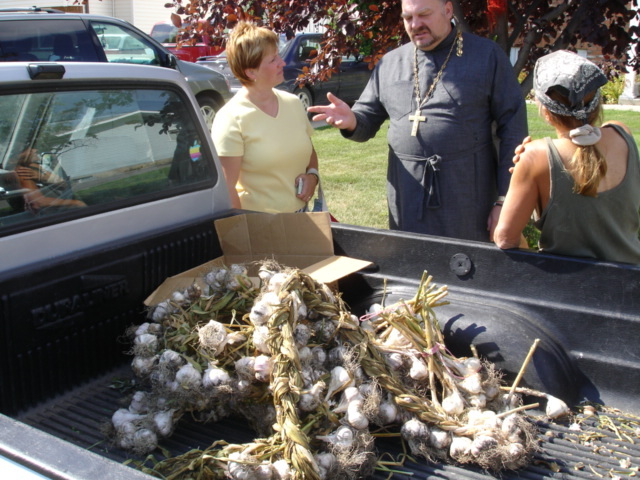 The point is to replant the harvested garlic each year instead of selling it. The calculations involve assuming 5 cloves per head. Planting the cloves multiplies your seed stock at a dramatic rate in a few years. Seed stock, especially for crops like garlic, can be initially expensive to buy, so replanting to multiply your stock has real impact on your bottom line. Those of you with small yards, or maybe even no yard, are asking, “Yes, but how much land do you need to generate $250k?” Nowhere near as much as you might think. This is where SPIN-Farming’s standard units of production come in handy. I figure I need about a half SPIN segment, or 500 sq. ft., for 1,000 cloves. 25,000 cloves requires 12.5 segments, which is around a 1/4 acre. 125,000 cloves will require 50 segments, just over an acre. That’s about 2 suburban backyards. So if you don’t have the space yourself, you can team up with someone else, using SPIN’s multi-locational model. Seed stock multiplication is something I am going to start paying more attention to, because saving seed may save you a pretty penny, and help you generate lots of ’em, too. 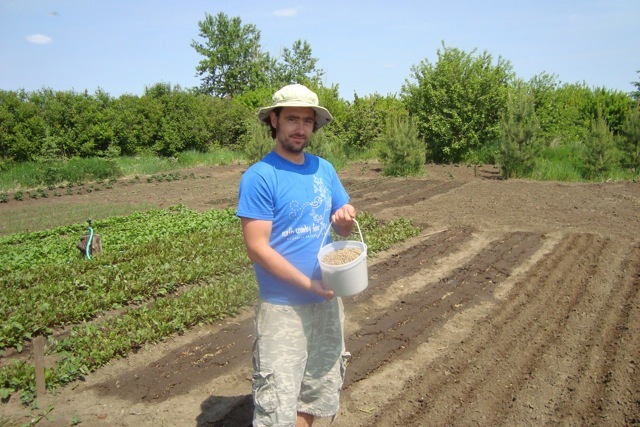 Seed saving is virtuous, and a moneymaker too! GET MORE MONEY-GENERATING TIPS LIKE THESE IN THE SPIN ONLINE SUPPORT GROUP. FREE TRIAL MEMBERSHIP WITH THE PURCHASE OF ANY SPIN GUIDE. The beauty of SPIN-Farming is that it can use spaces that are not suitable for traditional farming. Any remnant of land that measures at least 1,000 sq. ft. can contribute enough production and revenue to be worth a farmer’s time. So when you put on your SPIN glasses you start to see cropland everywhere. But not everyone thinks farming is beautiful. 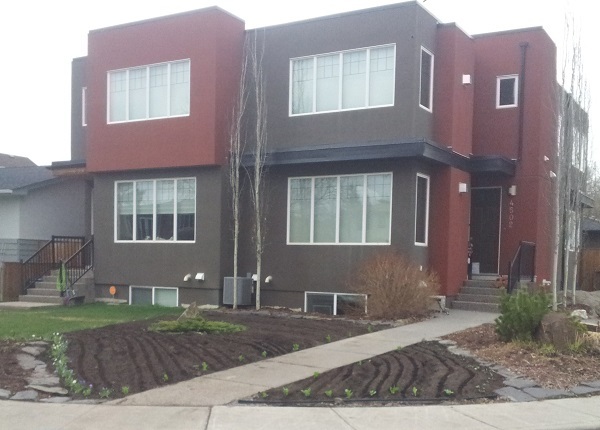 In fact some communities have bylaws prohibiting the growing of food in front yards. So that means SPIN farmers sometimes need to get creative. Like here. At this site, the backyard is a kale forest since the SPIN farmer, Rod Olson, owner/operator of Leaf & Lyre Urban Farms specializes in that crop (varieties: Curly and Red Russian), selling $15k a year to one restaurant alone. But he just couldn’t resist putting the front yard to use, too, so he created a “river of food.” It’s not your standard SPIN beds, but it provides food to the owner throughout the season in exchange for the use of her backyard space. So Rod gets his kale factory and keeps peace with the neighbors. And who knows? It may launch a new business designing food river gardens, once the neighbors see just how beautiful an edible garden can be. 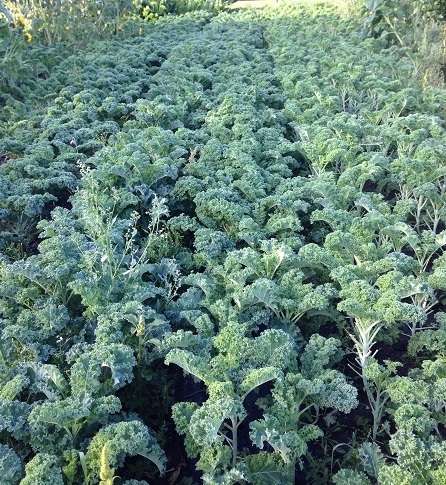 Leaf & Lyre Urban Farms specializes in kale. Other lucrative specialty crops include leafy greens, garlic, carrots and potatoes, and flowers. GET MORE CREATIVE IDEAS ON FINDING NO-COST CROPLAND IN THE SPIN ONLINE SUPPORT GROUP. FREE TRIAL MEMBERSHIP COME WITH THE PURCHASE OF ANY SPIN GUIDE. We are working up our 2017 seed orders. First thing we do is to inventory leftover seeds from this season. We are not worried about loss of germination but we may slightly over plant just in case. For what will be transplants we always overseed by 15-20%. We get many catalogs, and we go through most of them. Several are just recycled from past experiences with companies or price and customer service problems. 1 catalog we get is dirt cheap but packs contain very few seeds for the money. 15 seeds for a dollar or 50 seeds for $3.95 from a different company. Which is the bargain? We have 2 main companies that are most reliable and have good luck with their seeds. I also place smaller orders from a couple companies that carry new or tried and true varieties that we like. My seed potato are from local suppliers at wholesale prices. We also will order from an onion supplier. We are not real big on heirlooms, not that they are bad we have better luck selling hybrids in most cases. We order early and get early season discounts and go for free or low cost shipping. This is not a place to hurry through or skimp to save a little money. Do your research and keep in mind your time spent now will be rewarded when you harvest. 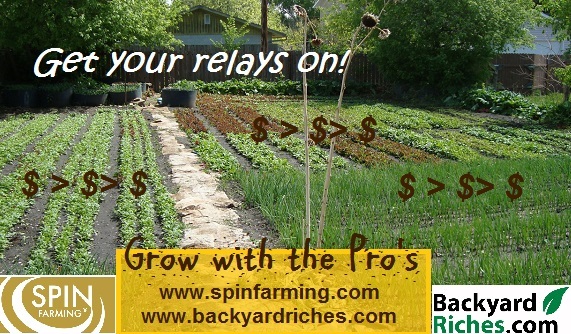 GET MORE SAVVY SEED BUYING TIPS FROM THE PRO’S IN THE SPIN ONLINE SUPPORT GROUP.. TRIAL MEMBERSHIP COMES WITH THE PURCHASE OF ANY SPIN GUIDE. YOU”LL SAVE LOTS OF BUCKS AND KNOW THE BEST AND RARE SOURCES. Because of its backyard-size scale, SPIN-Farming emphasizes crops with very short growing times that can be grown and harvested very quickly, because that is the way to multiply your production from a small space. But perennial crops, like these sunchokes, can also come into play. Right now I am growing them in the perimeter area of my SPIN farm. But if you have the space, a segment size planting can be worth a lot of money. A local garden center is always asking if we have any, and they are willing to pay $10 lb. It’s also a pretty easy sell at market, and to chefs. Once planted, sunchokes are there to stay. Other perennial crops, like horseradish, rhubarb, mint and raspberries can also earn their place in a SPIN crop repertoire. Even if you have limited space, don’t limit your planting to just annuals. Perennials are crops that keep on giving. GET MORE NEW PRODUCT IDEAS IN SPIN’s ONLINE SUPPORT GROUP. FREE TRIAL MEMBERSHIP COMES WITH THE PURCHASE OF ANY SPIN GUIDE. Perennial weeds come in all shapes and sizes. Some are more controllable than others. In sub-segment size areas under 500 sq. ft. you can take try the Terminator approach to eradicate them completely to keep the plot in production. Larger areas take more finesse because it is harder to know what you are dealing with. For instance, I’ve worked plots for years without any sign of weeds, and then one season they just start showing up. Many SPIN farmers are presented with offers for larger size plots, in the 1/4 to half-acre range, that are too good to refuse. They clean them up so they look like a field of dreams and then bindweed starts sprouting everywhere. In these situations eradication will take time and effort you don’t have, and it might not even be possible. Instead, fight one aggressive plant with another. 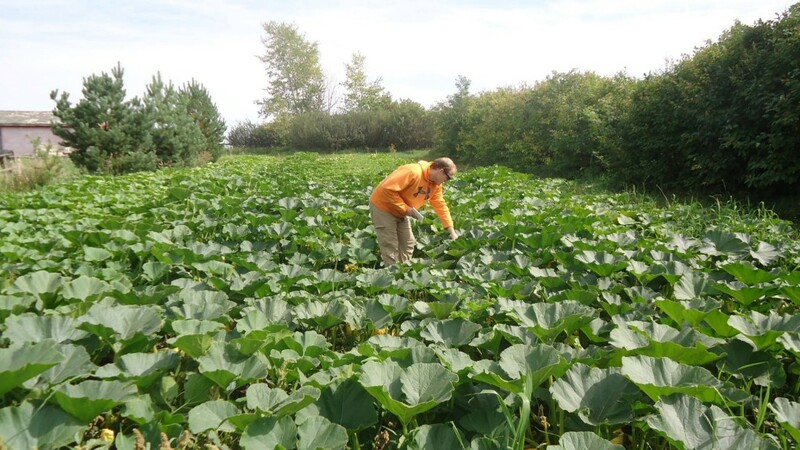 If you put in widely spaced crops that grow relatively quickly, such as winter squash, they can duke it out with the weed once they start vining out. In essence they are acting as a weed suppressant in their own right. 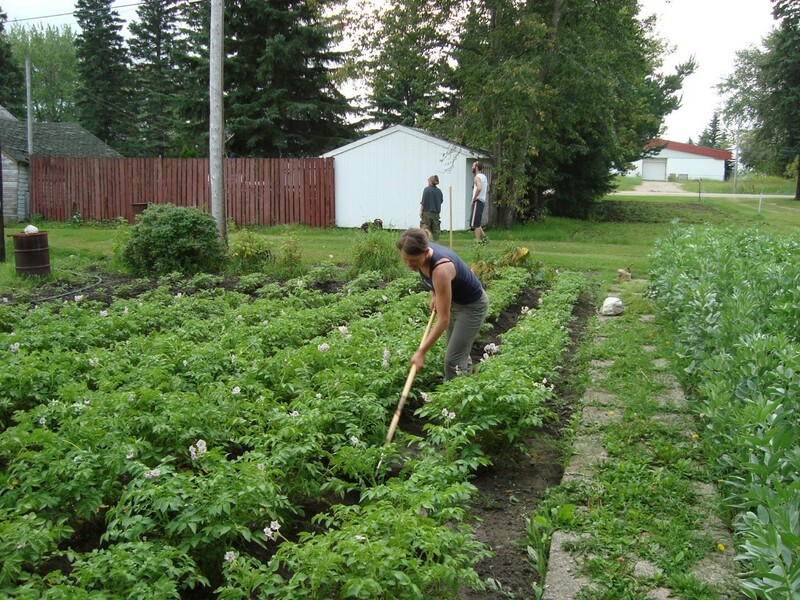 Potatoes are also a good option, since once you hill them, you can easily aggressively weed around them. Green beans and broad beans are other options and are ones I will be using this year in a perennial grass problem area. So when it comes to weeds know there is another approach besides hasta la vista. 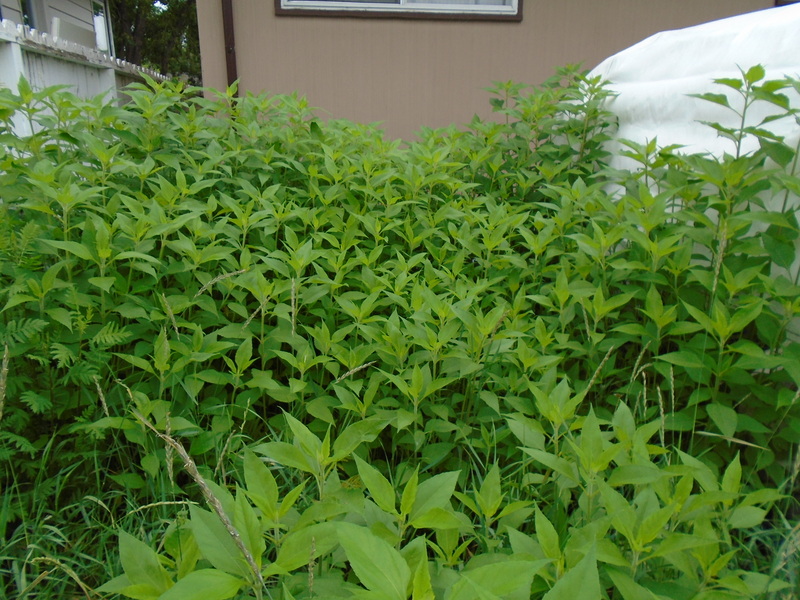 Instead use appropriate crop selection and technique to win your battle with weeds. FIND OUT OTHER TIME AND EFFORT SAVING WEEDING TECHNIQUES IN THE SPIN ONLINE SUPPORT GROUP. RECEIVE FREE TRIAL MEMBERSHIP WITH THE PURCHASE OF ANY SPIN GUIDE. 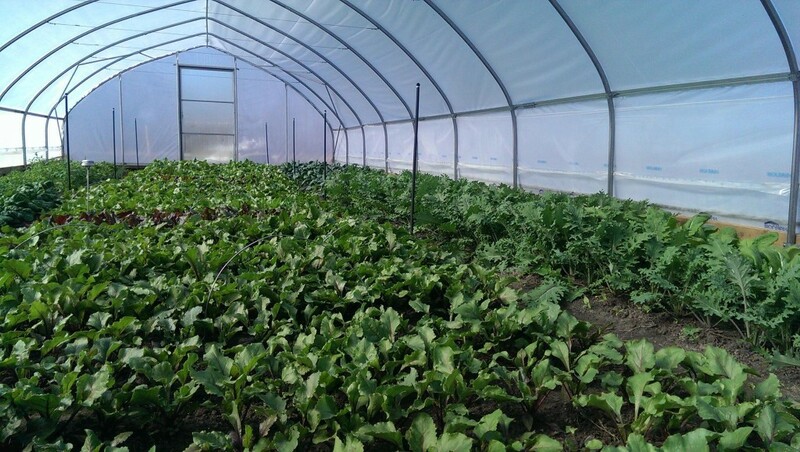 Unheated high tunnel, or hoophouse, production is being practiced more widely because it is a profitable way to grow and sell year round. That requires extra attention to, and management of, soil health, as this Backyard Riches member explains. One of the challenges of high tunnel production is that there is no natural rainfall to leach the soil. Although I collect rainwater, it supplies only 20% of my high tunnel irrigation requirements. The other 80% comes from municipal water. So there are three main concerns I deal with. 1. Saskatoon city water, which supplies my farm, contains 142 ppm calcium/magnesium carbonates. Every inch of irrigation adds about 0.75 lb of lime per segment. At the rate of 1? of irrigation per week for 6 months a year, this works out to 20 lbs of added lime per segment, which can raise the soil pH and cause production issues. To neutralize this, I till in 10 lbs of organic sulfur per segment per year. 2. Saskatoon city water contains 13 ppm of chloride and 2 ppm of chlorine. Chlorine reacts with soil organic matter to form chloride. Outdoors, this is leached by rainfall. In a high tunnel, this works out to 2 lbs of added chloride per segment over 6 months of irrigation. To counter this, I try to include beets or chard in the rotation at least once every two years. These crops can ‘mop up’ significant amounts of chloride. 3. Soil organic matter is consumed very rapidly in high tunnels. I add composted manure, compost and alfalfa meal at least twice per year to compensate. 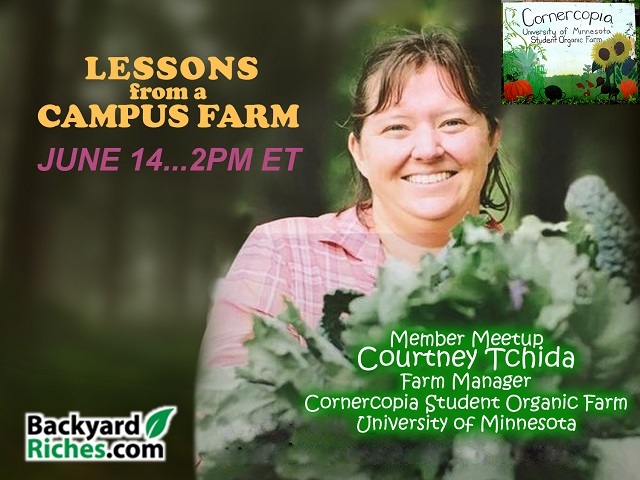 GET MORE TIPS ON BACKYARD-SCALE HIGH TUNNEL PRODUCTION IN THE SPIN ONLINE SUPPORT GROUP. GET FREE TRIAL MEMBERSHIP WITH THE PURCHASE OF ANY SPIN GUIDE.